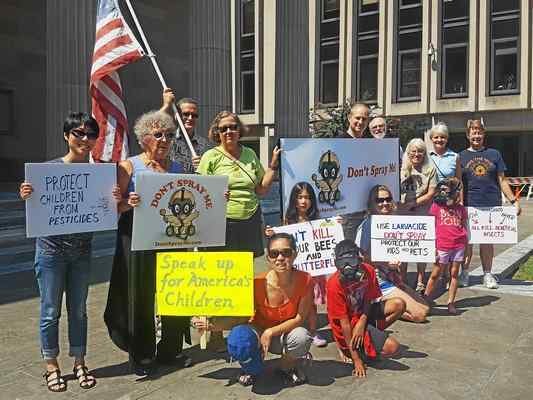 WEST CHESTER >> With a goal of eliminating chemical spraying for mosquitoes by local municipalities, more than two dozen activists rallied Saturday at the historic courthouse. The grassroots group, “Don’t Spray Me!” began in the borough three summers ago. Comitta was mayor at the time and said that from those first steps, a West Nile task force committee was created in West Chester. For whatever reason, since the task force was formed, there has been no spraying for mosquitoes in West Chester…. • The release says “After exhausting all other available mosquito control strategies…” Do you know of other such strategies to date, such as working with the municipal government to educate residents, larviciding suspect bodies of standing water, or alerting property owners whose properties may be violating the Health Department’s regulation against allowing mosquitoes to breed in standing water? • Are adequate warnings posted well in advance so residents and visitors will know to stay out of the way of the spray and take protective measures? • Did you observe people who were not aware of the recommended precautions? • Is there a lead truck with a loud speaker in front of the spray truck warning people to stay indoors or leave the vicinity? • Does the truck spray more than once in any street or on any area? Does it crisscross any area, thus delivering a double dose to some addresses? • Is the spray shut off as the truck approaches a stream or body of water and if so, how many feet away? • After spraying, what difference do you notice in the number of mosquitoes and other insects such as honey bees and dragonflies? • Did you notice any effect, either immediate or after a few days, on children, cats, frogs, birds, or bats? • How long does it take for the adult mosquito population to get back to about what it was before? 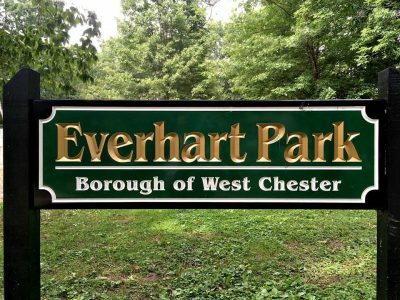 West Chester, PA – The Chester County Health Department, in conjunction with the Pennsylvania Department of Environmental Protection (PA DEP), will conduct a mosquito control treatment spray in portions of Phoenixville Borough (map of treatment area). The treatment is scheduled for Thursday, August 31st from 7:45 pm to 11:00 pm. The rain/makeup date for this event is Tuesday, September 5th from 7:45 pm to 11:00 pm. The Chester County Health Department will use PA DEP equipment – a silver Ford Ranger affixed with the PA DEP logo and BU# BU2626 – to conduct the spray. A truck-mounted sprayer will apply 1.0 ounces of U.S. Environmental Protection Agency-approved product (Biomist 3+15) per acre of land. 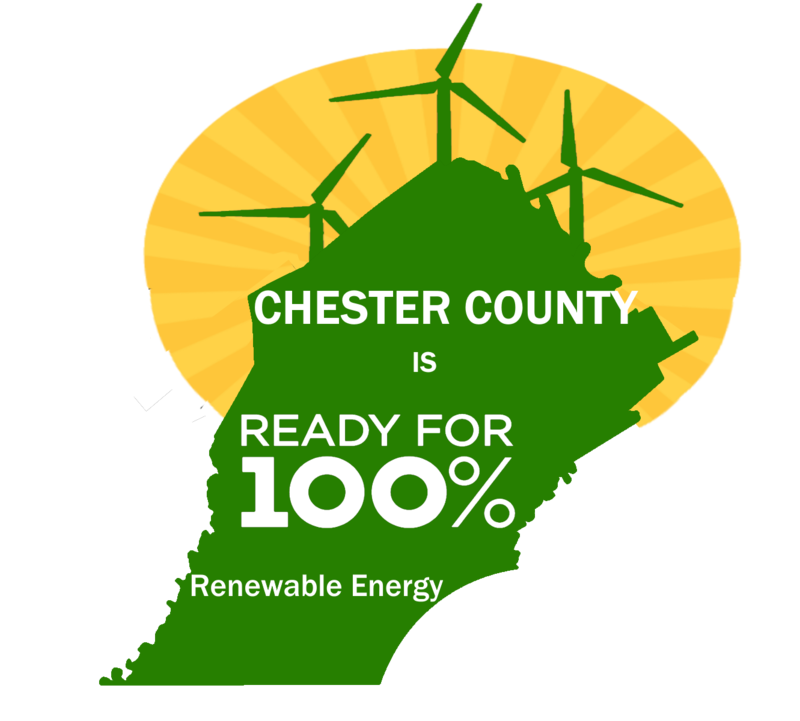 A white GMC truck affixed with the Chester County Health Department logo with BU# BU1901 will be the lead truck. The mosquito control spray becomes inactive in just a few hours or with sunshine. Sprays are conducted after sunset, when mosquitoes are most active and bees have returned to their hives. Sprayers are turned off near bodies of water and apiaries to protect aquatic life and bees. The Chester County Health Department also notifies registered beekeepers and residents who are listed as hypersensitive in a designated spray area prior to conducting a spray. People who are concerned about exposure to mosquito control products can reduce their potential for exposure by staying indoors with children and pets when their neighborhood is being sprayed. If you would like to take extra precautions after the spray is completed, you can rinse off outdoor furniture or playground equipment before use. 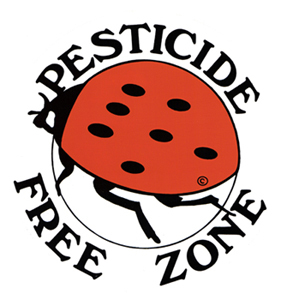 Although spraying helps to reduce mosquito populations, the Chester County Health Department encourages residents to “Make You and Your Home a Bite-Free Zone” to prevent WNV and other mosquito-borne diseases…. Why: The Chesco Health Department has produced no evidence that spraying reduces West Nile disease and we know it can kill bees and fish and harm people but still they are spraying anyhow! Costs are high, benefits lacking. 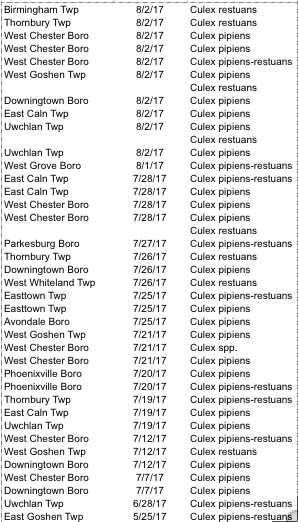 Latest municipalities targeted for spraying: Downingtown and East Caln, Thursday Aug. 24. If you live there, please see here and see if you can help us on the needed observations. Next communities to be sprayed: who knows? Educate and larvicide but Don’t Spray Us! Please come and bring friends and relatives, and a sign if you can. • Are adequate warning posted well in advance so residents and visitors will know to stay out of the way of the spray and take protective measures? • Is there a vehicle with a loud speaker in front of the spray truck warning people to stay indoors or leave the vicinity? • Does the truck spray more than once in any street or on any area? 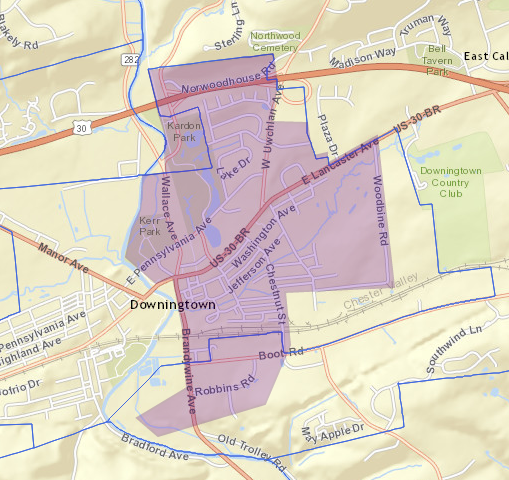 West Chester, PA – The Chester County Health Department will conduct a mosquito control treatment spray in portions of Downingtown Borough and East Caln Township (map of treatment area). The treatment is scheduled for Thursday, August 24th from 7:45 pm to 11:00 pm. The rain date for this event is Monday, August 28th from 7:45 pm to 11:00 pm. The Chester County Health Department uses a truck-mounted sprayer to apply 1.5 ounces of U.S. Environmental Protection Agency-approved product (DeltaGard) per acre of land. The mosquito control spray becomes inactive in just a few hours or with sunshine. Sprays are conducted after sunset, when mosquitoes are most active and bees have returned to their hives. Sprayers are turned off near bodies of water and apiaries to protect aquatic life and bees. The Chester County Health Department also notifies registered beekeepers and residents who are listed as hypersensitive in a designated spray area prior to conducting a spray. People who are concerned about exposure to mosquito control products can reduce their potential for exposure by staying indoors with children and pets when their neighborhood is being sprayed. If you would like to take extra precautions after the spray is completed, you can rinse off outdoor furniture or playground equipment before use. N.b. as of 10 a.m., the forecast for 4-6 p.m. TODAY is: PARTLY SUNNY. We cordially invite you to an end-of-summer Unity in Community Picnic, sponsored by the Sierra Club Sustainability Committee, Don’t Spray Me! 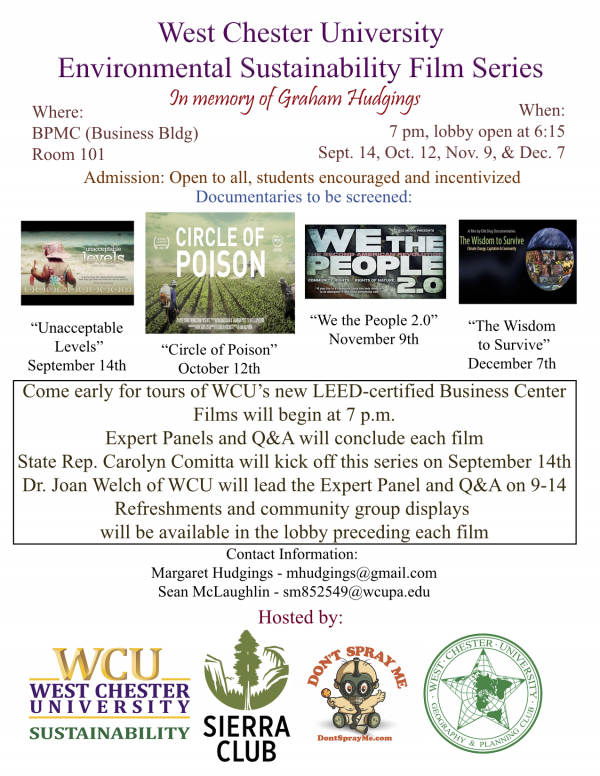 and the West Chester Food Co-op–3 groups working together for people and the environment. We are happy to be able to offer free frozen yogurt for kids from Whirled Peace Frozen Yogurt, sponsored by DSM, Sierra Club, Carolyn and Tom Comitta, Margaret and Jim Hudgings, and Thriving Pets. Others are welcome to purchase frozen yogurt from the truck. Come learn about Bat House-making, get the kids involved in fun environmental games, enjoy sample food from the Food Co-op, experience demonstrations such as Tai Chi and Yoga, see Sierra Club displays, and be in plenty of good company. Please bring your picnic and utensils. We also commemorate the life of Graham Hudgings, an inspiration to our founding and all of our activities and a long-time sufferer from multiple chemical hypersensitivities, who tragically left us earlier this year. For more information contact Margaret Hudgings at mhudgings@gmail.com/ or 610-692-3849. News release from Chester County Health Department, 8/8/17, 4:30 p.m. 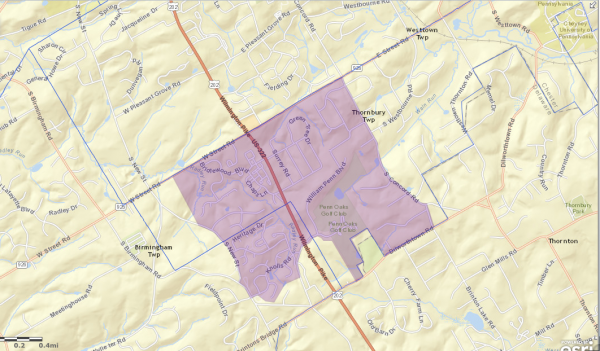 The Chester County Health Department will conduct a mosquito control treatment spray in portions of Birmingham and Thornbury Townships (map of treatment area). The treatment is scheduled for Thursday, August 10th from 7:45 pm to 11:00 pm. The rain date for this event is Tuesday, August 15th from 7:45 pm to 11:00 pm. The Chester County Health Department uses a truck-mounted sprayer to apply 1.5 ounces of U.S. Environmental Protection Agency-approved product (Permanone) per acre of land. The mosquito control spray becomes inactive in just a few hours or with sunshine. Sprays are conducted after sunset, when mosquitoes are most active and bees have returned to their hives. Sprayers are turned off near bodies of water and apiaries to protect aquatic life and bees. The Chester County Health Department also notifies registered beekeepers and residents who are listed as hypersensitive in a designated spray area prior to conducting a spray. People who are concerned about exposure to mosquito control products can reduce their potential for exposure by staying indoors with children and pets when their neighborhood is being sprayed. If you would like to take extra precautions after the spray is completed, you can rinse off outdoor furniture or playground equipment before use. Although spraying helps to reduce mosquito populations, the Chester County Health Department encourages residents to “Make You and Your Home a Bite-Free Zone” to prevent WNV and other mosquito-borne diseases. Because mosquito-borne diseases are spread through the bite of an infected mosquito, residents can reduce their risk by using insect repellent and other personal protection and getting rid of standing water on their property….